Fighting with Gram-negative enemy: Can outer membrane proteins aid in the rescue? Outer membrane proteins (OMPs) are distinctive features of Gram-negative bacteria. Apart from their structural role, they play a crucial role in host pathogen interaction, virulence and pathogenesis of bacteria. 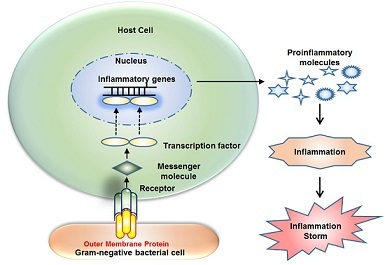 Upon interaction with the host immune cells, OMPs stimulate production of proinflammatory molecules that may result in an uncontrolled inflammation, leading to severe sepsis or septic shock, which is a major cause for many deaths worldwide. OMPs are composed of antiparallel β-barrels connected via long loops. Several studies suggested that these surface exposed loops interact with the host cell and participate in the virulence. OMPs of Gram-negative infectious bacteria demonstrate significant conservation in the sequences, and share structural similarities within and among different species, making them useful diagnostic targets and effective vaccine candidates. Here we describe multiple aspects of OMPs, particularly highlighting their classes, structural details as well as their role in inflammation.